Some of the priciest lenses are the longest ones, and they tend to be fairly large and weighty piece of equipment, too. Teleconverters appear to solve all three problems, being far cheaper, smaller and lighter than telephoto optics, and having an effect from as little 1.4x to around 3x. The Kenko 2X Teleplus Pro 300 DGX 2x sits between the two, with a 2x conversion factor for compatible lenses and contacts to maintain both autofocus and metering functionality. Available in Canon and Nikon fits, with a similar model available for Sony Alpha users and with a 1.4x zoom version, the teleconverter contains seven elements arranged over four groups, with multi-coatings used throughout to help boost light transmission and minimise aberrations. Kenko claims the Teleplus Pro 300 AF DGX 2x is designed to match the optical quality of the lens used, and that it won't introduce any additional vigentting. Build quality appears good, with a combination of matt plastic and rubber used for the outer barrel, and a metal mount at each end. The lens release is large and moves easily when pulled back, while two red dots indicate clearly where to mount both the lens and the teleconverter. In terms of results, the model doesn't appear to create any vignetting, and when images are viewed close there doesn't appear to be any significant difference in chromatic aberration either. The latter appears to verify Kenko's claims regarding the teleconverter's optical qualities, although there is another reason for this: contrast is slightly lower in images shot with the teleconverter than in those shot without, meaning that edges are less defined, so any fringes are slightly blurred. This drop in contrast is somewhat expected, and it means that details lack a little definition, but this is unavoidable when any further optics are added to a main lens. Overall, the Kenko Teleplus Pro 300 AF DGX 2x does a decent job to increase focal length while maintaining an acceptable standard of image quality, and it's less than half the price of Nikon and Canon's own 2x teleconverters. 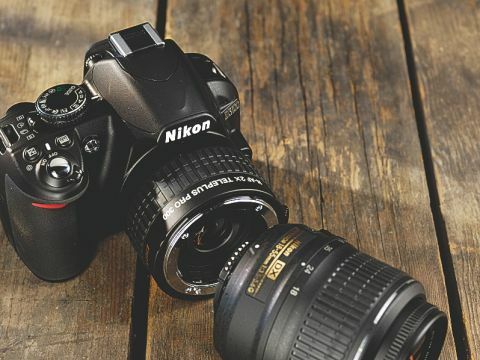 Nikon users who want to use it for macro shooting may be disheartened to learn that the model won't autofocus properly with the AF-S Micro Nikkor 60mm f/2.8 G ED lens, which Kenko makes clear. And testing it with the newer AF-S DX Micro Nikkor 85mm f/3.5G VR shows similar AF issues. Manual focusing in each case is possible, though.